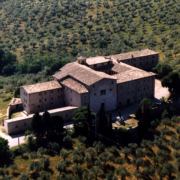 The beautiful and imposing Abbey of San Felice is at the foot of the Martani Mountains, surrounded by olive trees and oak trees. The abbey is today a set of more structures related to different eras, arranged on either side of the abbey church and consists of three distinct parts: the Benedictine, Augustinian and an appendix farm, built mostly in white and pink limestone from the nearby village of San Terenziano. Imposing and impressive is the exterior view of the three apses closed at the top by a series of blind arches on which there are loopholes and mullioned windows. 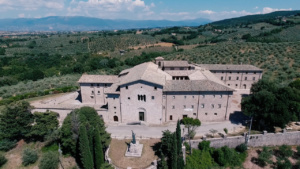 The church was built in one of the oldest places of Christian worship in Umbria, where since the fourth century was venerated the memory of Saint Felix, bishop martyred under Diocletian’s persecutions. 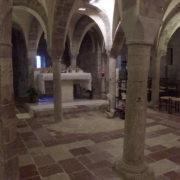 This place was chosen centuries later, probably between the eighth and ninth centuries, by a group of Benedictine monks to build a monastery, then it expanded through the centuries. 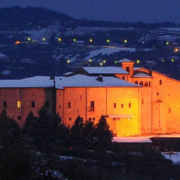 The complex was built not far from the Via Flaminia which was at that time the main economic and financial influence vehicle but also religious and cultural of the famous and powerful Abbey of Santa Maria di Farfa. 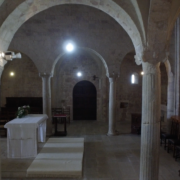 The construction of a true church on the burial place of San Felice date 950 according to studies scholar Ludovico Iacobilli Foligno, employing extensively plundered material of the primitive oratory but also Roman remains that were found in the area. A Corinthian capital still decorates the upper part of the facade of the church, as well as within different are the fluted columns and the Roman capitals reused. In 1255 has documented a certain Abbot Giacomo, so we imagine that the abbey was, at that time, in full swing. 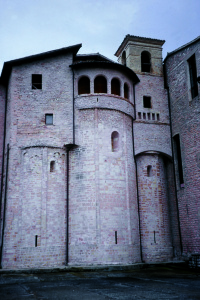 In 1373 Pope Gregorio IX underwent San Felice, with a bubble, the Abbey of Santa Croce of Sassovivo – Foligno, which followed the fortunes until its decline in the fifteenth century. 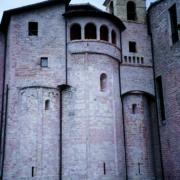 In 1450, however, Pope Nicholas V, due to the decay of the church, the Benedictine monks away and suppressed the abbey, entrusting the care of the complex to the Augustinians. The expansion of the complex and the construction of the cloister was later decorated later with the story of the martyrdom of San Felice. 1500 was a difficult period for the Abbey, because of quarrels within the order and contentions about the vast land holdings. Local sources report that at the end of the sixteenth century lived in the Abbey 28 monks and 14 novices. But the Augustinians not had good relations with Gianesi, so much so that they too moved away and even excommunicated in 1798 for “tax evasion” and the bad management of landed property. 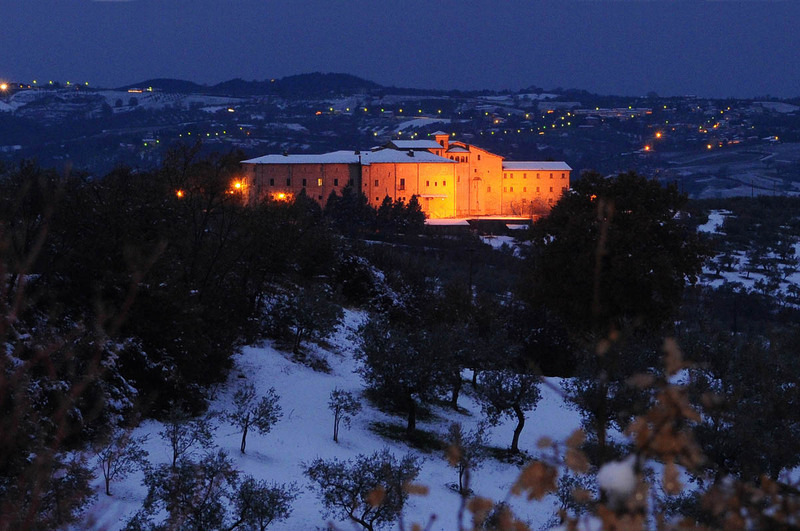 The abbey’s assets were then, after the excommunication, confiscated and donated to the City Schools of Spoleto. It was also issued a public auction to dispose of all objects. 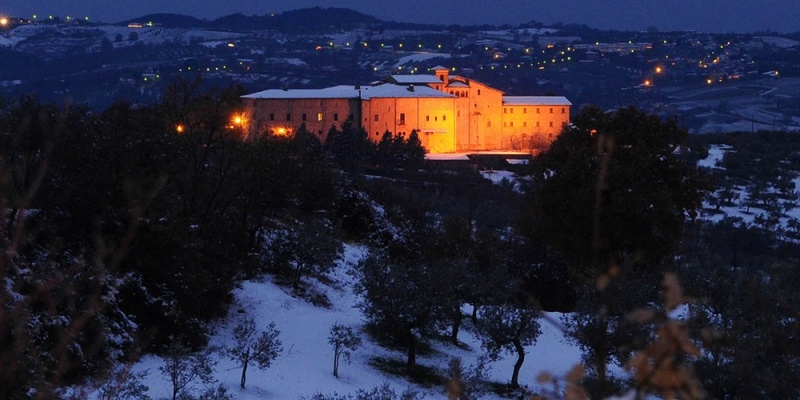 To get an idea of the rich heritage of ‘abbey, you can recall the outstanding library preserved within the complex, about 1600 books, which were taken away in “baskets and bags” as referring to the chronicles, to be transferred to Spoleto. 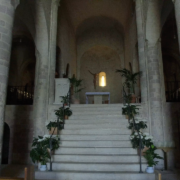 In the monastery took over then briefly Passionists, who remained there until 1803. 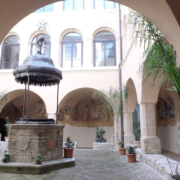 Since 1815 the monastery became instead the cradle of the Congregazione del Prezioso Sangue, founded in Rome by S. Gaspare del Bufalo, whose priests are still ruling over San Felice. Today it is the bronze statue of S. Gaspare, next to two oak trees, to welcome pilgrims and tourists, often by chance, arriving in this magical place. The visit of the Abbey begins the Romanesque church, showing a pink and white stone façade, transformed in the sixteenth, a portal to three rabbets and the elegant window with three lights above which is a fourth-century walled capital. 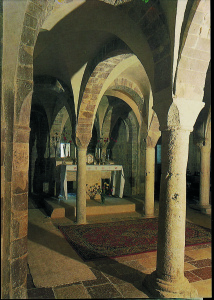 original structure and which has suffered less alterations in the following centuries, however, is the crypt, jewel of the church, perhaps one of the most interesting of Umbria. It is accessed through two staircases placed at the end of the aisles. In the “forest” of columns and low vaults characteristic of the Romanesque crypts, meet, stick figures carved on the capitals of animals, which in their primitive simplicity we still communicate the wonder of the ancient men for creation. It is likely to figures taken from the Medieval bestiary, that make this place full of charm. Behind the altar table, in five columns, rests the sarcophagus (V-VI century), travertine containing the sacred remains of S. Felice. 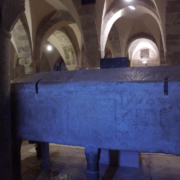 It is a kind of stone ark with geometric decorations that recall the artistic context of the classical world and two stylized animals that instead recall the medieval figures of the capitals. She had to be here probably the beautiful painting of altar frontal (now in the National Gallery in Perugia), where they were told the various scenes of the martyrdom work of a master Spoleto probably the end of the century. XIII, nicknamed really the Master of San Felice. 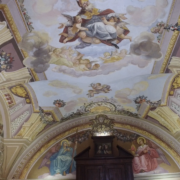 The entire church was completely transformed in the Baroque period with paintings and polychrome wooden altars, as attested by various images; but fortunately it has been restored to its original look with a restoration “purist”, made in the 50s in 1900. 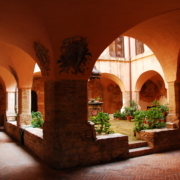 Of the ancient abbey body of considerable interest are the cloister built between 1500 and 1600 and Chapel (Old Sacristy), both decorated with a cycle of frescoes depicting the Passion of S. Felice. The decorations of the cloister, of dubious attribution and of little artistic value, however, are interesting source to discover, as in a gallery for pictures, the main episodes of the martyrdom of San Felice, the building phases of the church and the miraculous feature of San Felice healer from sickness bones. The decoration was carried out during the Augustinian period, you may indeed find some portraits depicting various famous Augustinian. On the sides of the cloister, not always accessible, are the Chapter House and the Refectory showing the benches and the reredos of the late seventeenth century, a stylish sink 1601 and a fragment of a fresco depicting the crucified Trinity. Ancient monastic body lean against the two powerful wings, the north and south, both of 1700.